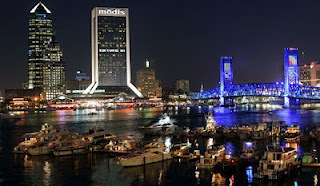 Directions from Jacksonville: Take I-95 South to I-4 west. Turn right on International Blvd. Exit at Visitors Circle. Details: You can experience human body flight! Indoor Skydiving at iFLY Orlando is safe for kids, challenging for adults, exciting for teens and realistic for skydivers. No experience is necessary, great fun for all ages, three and up. 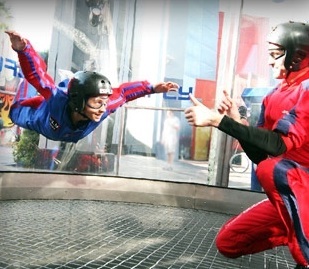 Located off of Interstate 4 near International Boulevard, IFLY Orlando is one of only 24 facilities in the world where adventurers can skydive indoors. The facility is a vertical wind tunnel that looks like a spaceship from the outside. From the inside, the adrenaline starts racing as you hear the roar of the engines. Thrill-seekers receive two flights for 1 minute each. And while that may not seem like a lot on paper, it actually feels a lot longer while inside the wind tunnel. No experience is necessary and the only age restriction is that participants be at least 3 years old and in decent physical shape. Judging from the experience recently by several kids who were at the center, the experience is a blast. As for the ride itself: One word, thrilling.